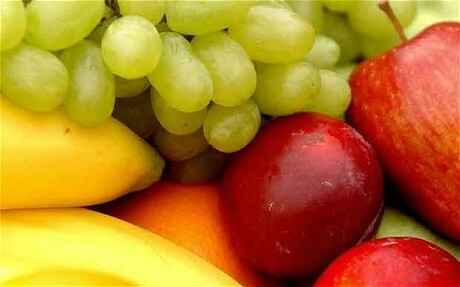 Eating fresh fruit and vegetables helps people resist the temptation of waist-expanding treats, scientists have found. When our supplies of glucose – found in carbohydrates – drop we begin to lose our ability to control desire, while our urge to eat increases. The lack of glucose â€“ which is used to power the brain â€“ makes us helpless against the urge to reach for high-calorie foods, researchers said. Obese people are particularly vulnerable, with even the slightest drop in glucose prompting irresistible cravings for carbohydrates, from which we get most of our sugar. These can be “good” carbs, such as fresh fruit and vegetables, brown rice and pasta and wholemeal bread, or “bad” varieties which include white bread and sugar, fizzy drinks, cakes, crisps and other packet snacks. Making sure the brain’s glucose levels do not drop could be the secret to staying slim, a study published in the Journal of Clinical Investigation suggested. Eating less and often could lower the chance of succumbing to the temptation of high-calorie foods, particularly for obese people, the researchers said. Prof Rajita Sinha, of Yale University in America, said: “The key seems to be eating healthy foods that maintain glucose levels. Volunteers were given injections of glucose and their brains were scanned while they were shown pictures of high and low calorie foods, as well as other objects. When glucose levels were lower, two areas of the brain which regulate pleasure prompted the desire to eat while the prefrontal cortex â€“ which gives us self-control â€“ lost its ability to control the impulses.